Melissa Clark, staff food writer for The New York Times has a new cookbook out called Dinner; Changing the Game. I do not own the book yet, but it is one that I will probably purchase. The premise is to make dinner interesting with a spin on traditional dishes. It also tries to make those meals doable in a reasonable amount of time. Many of the recipes can serve as an entire meal. Sheet pan meals have become very popular; all of the components cooked on one pan. I made one on the blog last year. But the chapter that had me interested was one called The Grind. All of the recipes used ground meat. 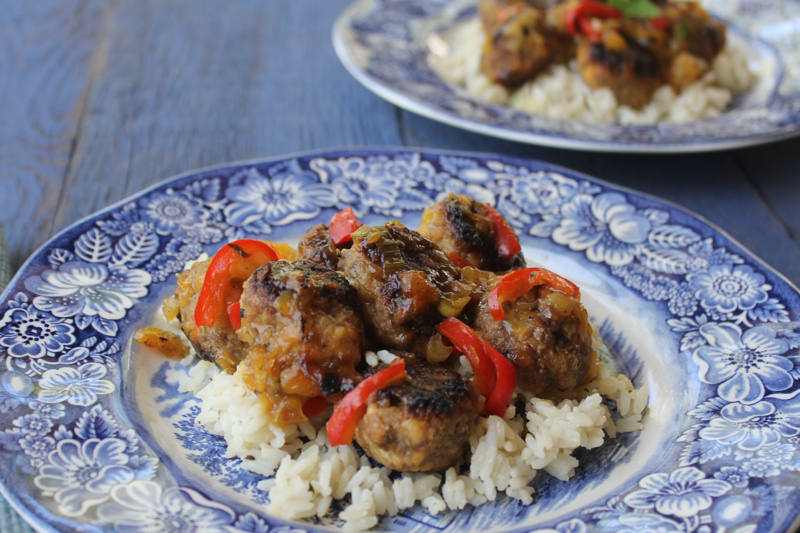 These Marmalade Meatballs were delicious. 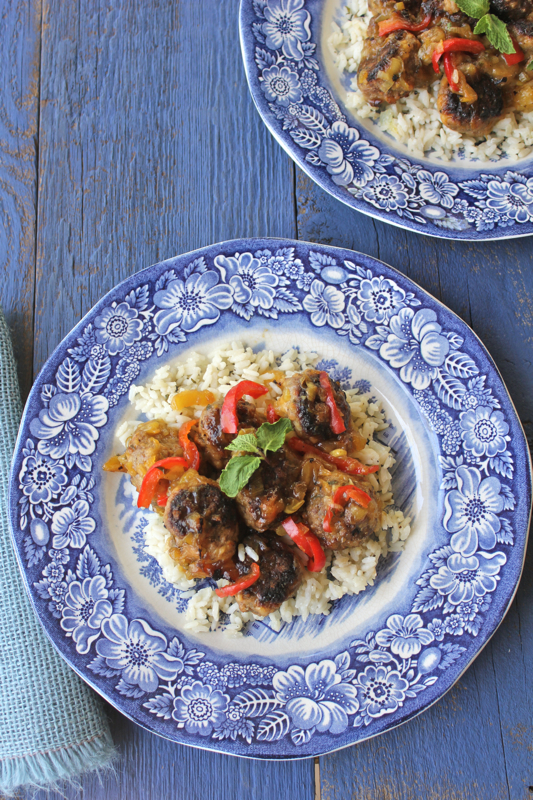 The orange marmalade glaze was sweet and sour and added a nice punch to the meatballs. Once the meatballs are formed it only takes 15 minutes to have them on the table. So if you mix and form the meatballs ahead of time, dinner is quicker than calling for take-out. I don’t know why I have never broiled my meatballs before. 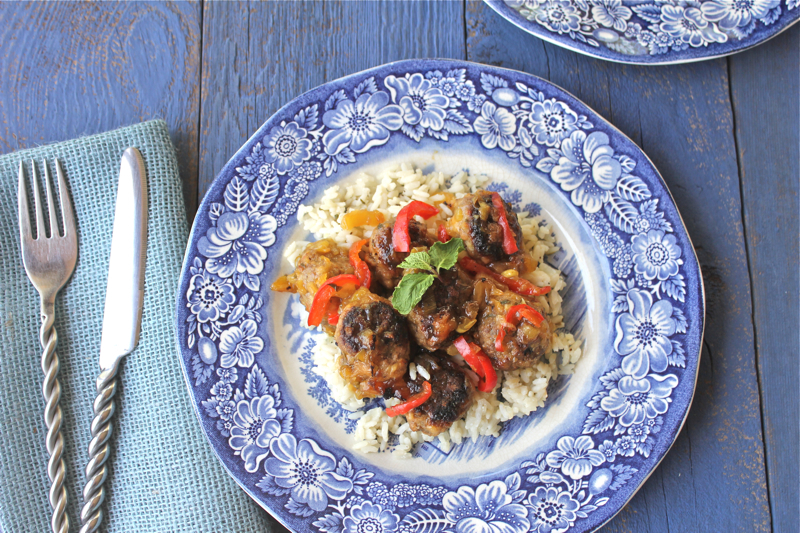 You can serve these slightly sweet meatballs over mashed potatoes, polenta or coconut rice. There is a recipe in the book for the coconut rice that sounds very good. Melissa Clark has done a great job of making weeknight dinners inventive and exciting. Set an oven rack at least 4″ from the heat source and heat the broiler. In a large bowl combine the beef, panko, anchovies, scallions, egg, salt, garlic, ginger, pepper, and allspice and mix gently but thoroughly. Form the mixture into 1 1/4″ balls. At this point you can cover and refrigerate them overnight before cooking. 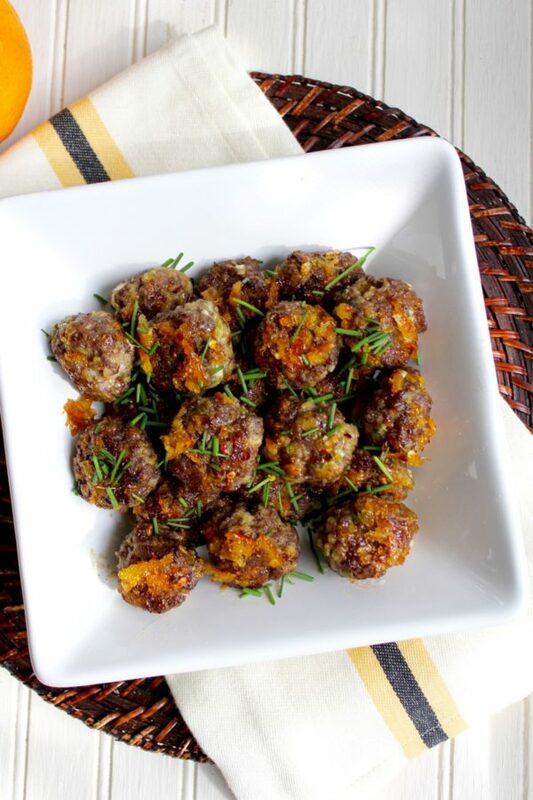 Arrange meatballs an inch apart on a rimmed baking sheet. Broil until meatballs are golden all over and cooked through; 5 to 7 minutes. Meanwhile, in a small saucepan, combine the marmalade, vinegar, soy sauce and red chili flakes and bring to a simmer. 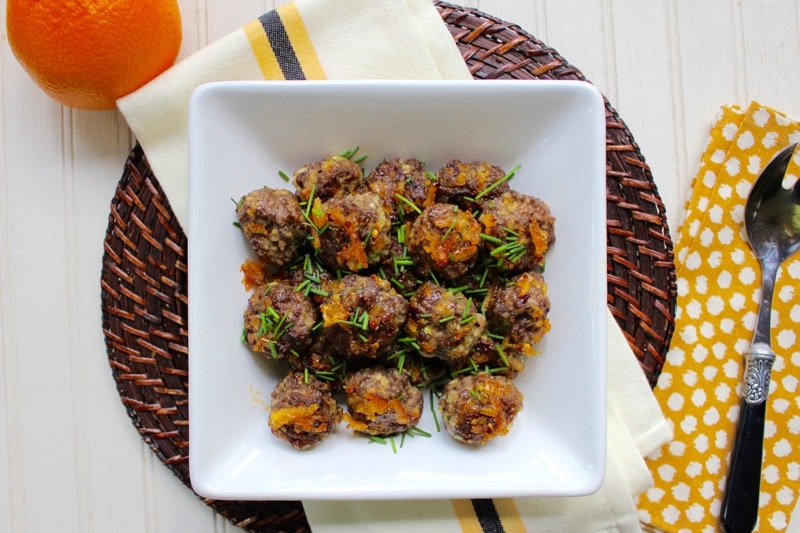 When meatballs are cooked through, brush them with the marmalade glaze and return them to the broiler. Broil until glaze is bubbling, 1 to 2 minutes. Serve with the chives scattered on top if desired. Posted on August 4, 2017 at 1:23 pm. Sometimes I have to admit to myself, that when given a choice of meat to enjoy, I would invariably choose ground beef. As a child my favorite meal was hamburgers and french fries. Ground beef is so versatile. It can be used in casseroles with a southwestern flavor or turn Italian in spaghetti. I remember my Aunt Pat making hundreds of meatballs for my cousin’s wedding. They were cooked in a combination of chili sauce and jellied cranberry sauce. I’m sure you remember that combination. That’s why this combination with a Polynesian spin caught my eye. Sweet and sour dishes are always popular in our house. There are interesting components to this recipe. The coconut milk in the meatballs is a nice touch. If you buy a can of coconut milk for this, you will have leftover milk. You can freeze the rest for future uses. The pineapple, ginger and garlic give just the right flavor to the whole dish. The only caveat that I have is that I think there is too much sugar. You can cut it down if you prefer. 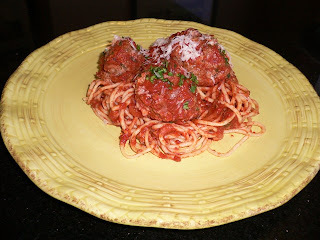 The sauce can be made ahead of time and the meatballs are easy because they are browned in the oven. This makes a colorful and complete meal on a plate with a scoop of rice. Enjoy! I know we did. 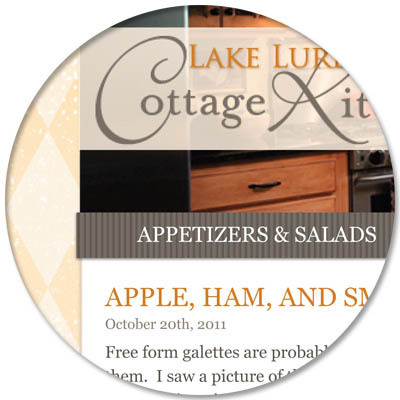 I am linking this to Foodie Friday at Rattlebridge Farm and Tasty Tuesday at The Comforts of Home. Preheat oven to 450 degrees F. In a small sauce pan over high heat, bring jalapeno and cider vinegar to a boil. Remove from heat, let stand 30 minutes, strain to remove jalapenos and set aside. In a large saucepan over high heat, combine jalapeno vinegar, sugar, pineapple juice and crushed pineapple; bring to a boil until sugar has dissolve. In a mixing bowl, combine water, cornstarch and soy sauce until smooth; pour into sauce and bring to a boil. Remove from heat and add onions, bell pepper, mint and cilantro; set aside and keep warm. In a medium bowl, gently fold together all meatball ingredients. Roll into 1-inch meatballs and place on a greased baking sheet. Bake 20 minutes. Transfer meatballs to a shallow bowl. Pour sauce over top and toss to coat. Posted on April 26, 2014 at 7:45 am. The city of Bayonne is in the Southwestern region of France near the border with Spain. The region is heavily influenced by the Basque language, architecture, and food. It is known principally for its fine chocolates and Bayonne Ham, which is cured with the espellette peppers. But these meatballs are also popular. We will not be traveling to this region of France but this recipe sounded so good that I had to try it. It was in the cookbook The French Slow Cooker by Michele Scicolone. I have found many good recipes in this book and this one did not disappoint. There are lots of red bell peppers in the recipe and although the title suggests that it is spicy, I found it to be quite mellow. 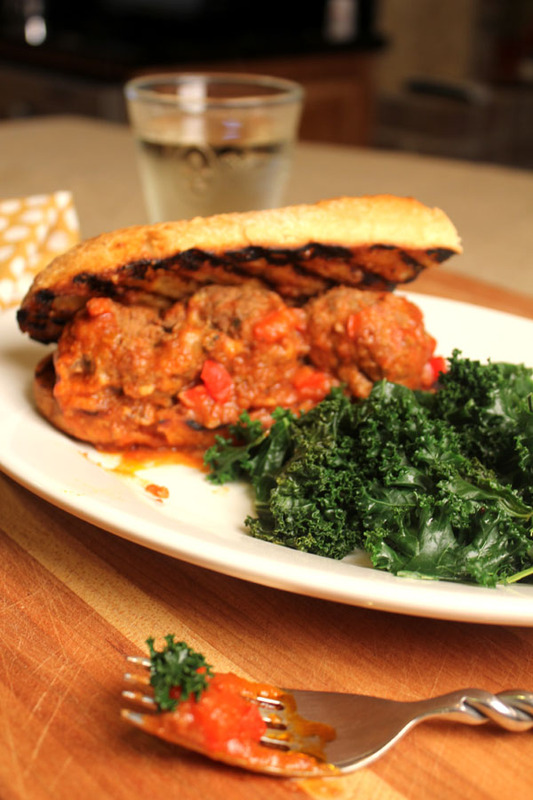 The large meatballs were almost “fall-apart” tender and it was delicious served on a toasted sourdough baguette with a serving of kale on the side. Although it was easy to do in the slow cooker, I see no reason why you couldn’t assemble it in a dutch oven and cook it in the oven at a low temperature. It can also be served over rice or orzo. I used orzo for our second meal (it makes a lot!) and it was a perfect combination; kind of like spaghetti and meatballs. Stir together the tomato puree, peppers, onion, 1 teaspoon salt, crushed red pepper, and bay leaf. Pour half of the sauce into a large slow cooker. In a small bowl, soak the bread in the milk for a few minutes. Lightly squeeze the bread and discard the milk. Spread the flour on a piece of wax paper. In a large bowl, mix together the soaked bread, ground beef, parsley, garlic, egg, cumin marjoram, and salt and pepper to taste. Moisten your hands and shape the mixture into 2-inch balls. Lightly roll the meatballs in the flour. Transfer the meatballs to the slow cooker and top with the remaining sauce. Cover and cook on low for 4 to 5 hours, or until the meatballs are cooked through. Discard the bay leaf and serve hot. As a side note I found it interesting that mayonnaise was purported to have been first made in Bayonne. Its name is a corruption of Bayonnaise. Posted on May 12, 2012 at 5:10 am. There are so many variations on tortilla soup. In my opinion you can’t go wrong with any of them. 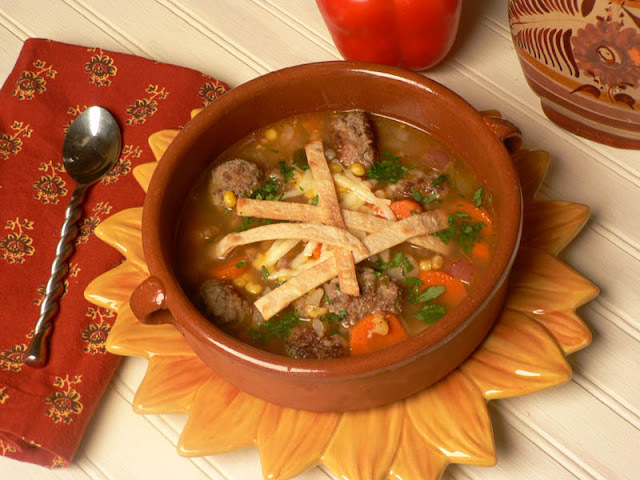 Tortilla soup is warming both in temperature and in taste. Jalapeno peppers give it just the right heat and the garlic infused broth adds pleasure for the soul. With the addition of flavorful meatballs to the soup, you will gild the lily of satisfaction. Sometime I want to do a series of posts on what you can do with a pound of hamburger. That is just what Cooking Light Magazine has done in it’s latest issue. 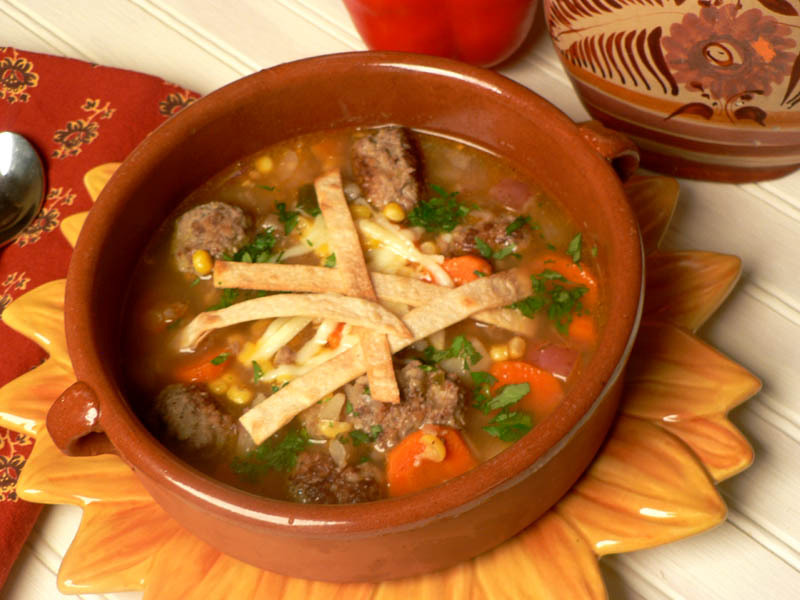 One of the recipes featured was this tortilla meatball soup, which I have adapted. A Summer and Fall of overindulgences have brought us to the realization that we need to temper our calorie intake. This soup is full of flavor and I have discovered that, for us, flavor trumps richness every time. Eating lighter fare does not have to be a sacrifice. There are several steps involved in making this soup, but all of them add to the depth of flavor. This is a good soup to make on a lazy weekend afternoon. Cut jalapenos and bell pepper in half lengthwise; discard seeds and membranes. Place pepper halves, skin sides up, on a foil-lined baking sheet. Broil 4 to 6 minutes or until blackened. Place peppers in a paper bag; fold to seal. Let stand 15 minutes; peel. Mince jalapenos, and coarsely chop bell pepper. Place tortlla strips in a single layer on a baking sheet; lightly coat with cooking spray. Broil for 3 minutes or until golden brown. Watch closely so the strips do not burn. Set aside. Combine 1/4 teaspoon salt, 1 garlic clove, panko, ground round, egg and minced chipotle chile in a large bowl, and gently mix until just combines. 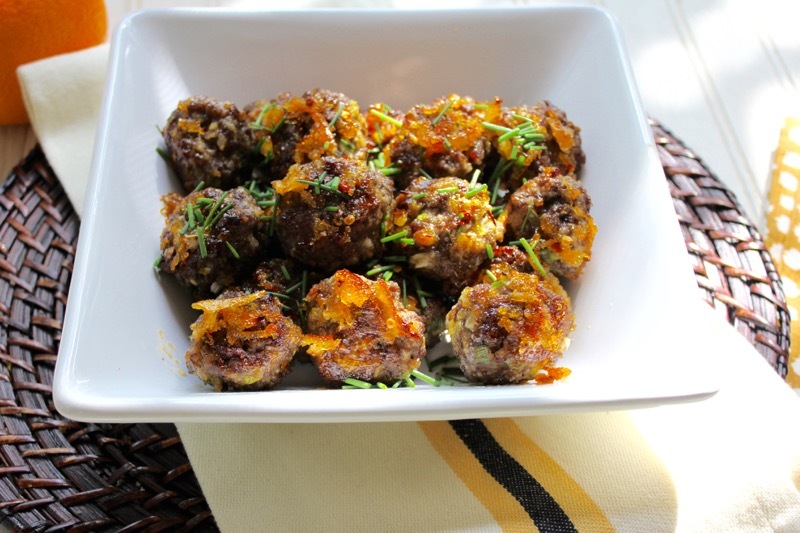 Shape the meat mixture into small meatballs. I ended up with 28. Place a Dutch oven over medium-high heat. Add oil to pan; swirl to coat. Add meatballs to pan; saute for 8 minutes, turning to brown on all sides. Remove from pan. Add onion, potatoes, and carrot to pan; saute 5 minutes, stirring occasionally. Add remaining 5 garlic cloves; cook 1 minute, stirring constantly. Add peppers, broth and 2 cups water; bring to a boil. Reduce heat; simmer 20 minutes or until vegetables are almost tender, stirring occasionally. Return meatballs to pan. Add remaining salt and the corn; return to a simmer. Cook 10 minutes or until meatballs are done. Ladle soup into each of 6 bowls; top each serving with cheese, cilantro and tortilla strips. 380 Calories. My new website is under construction. I plan to launch it on the third anniversary of my blog in January. Here is a sneak peak. I am so excited. It will be a collaborative effort of my talented Son and Daughter-In-Law. Check out Kristen’s business blog here. Posted on November 2, 2011 at 11:54 am. The Barefoot Bloggers are a group of foodies who post twice a month on recipes from The Barefoot Contessa, Ina Garten. Each member has a turn picking a dish from one of Ina’s many cookbooks or recipes featured on the Food Network. 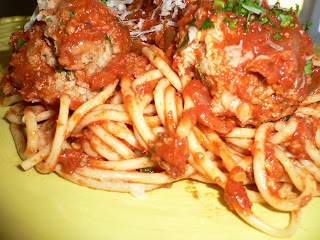 The first choice for February, Real Meatballs and Spaghetti, was chosen by Rebecca of Ezra Pound Cake. Visit her blog for a funny and informed look at cookery. The reason I became a Barefoot Blogger is because I find Ina Garten’s recipes to be straightforward ( no cream of mushroom soup here), seasonal, and usually delicious. Many of her recipes have become a permanent part of my repertoire. For the most part I liked this recipe. The meatballs were wonderful. I did cut way back on the salt though. To my taste, Ina overdoes the salt. I ended up with 22 meatballs as opposed to her 16. The three meats made for a flavorful combination and the addition of parmesan cheese added an extra tang. My problem was with the sauce. There was not enough of it and the flavor was just so so. If I were to do this again, I would double the sauce and add more aromatic herbs like basil, oregano and thyme. 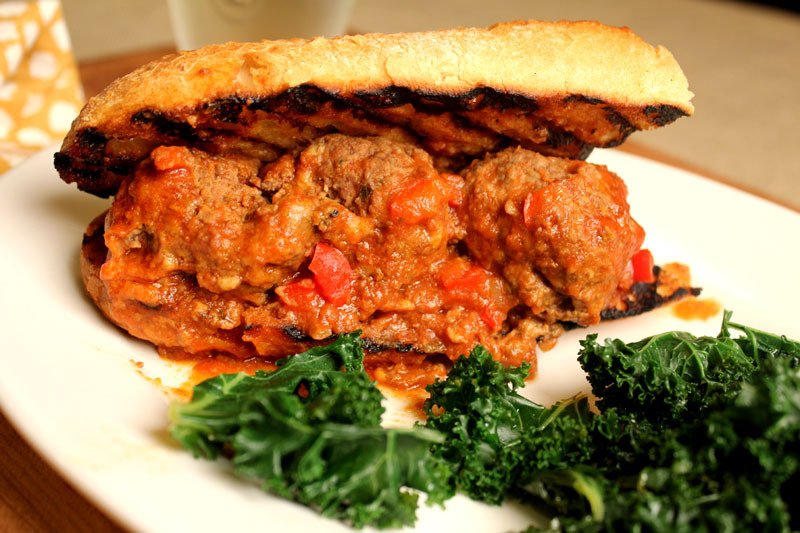 As it was, we had delicious meatballs left over for sandwiches on toasted sourdough bread. Thank you Rebecca! See all of you in two weeks for Meringues Chantilly. Place the ground meats, both bread crumbs, parsley, Parmesan, salt, pepper, nutmeg, egg, and 3/4 cup warm water in a bowl. Combine very lightly with a fork. Using your hands, lightly form the mixture into 2 inch meatballs. You will have 14 to 16 meatballs. Pour equal amounts of vegetable oil and olive oil intoa large (12 inch) skillet to a depth of 1/4 inch. ( I used less oil) Heat the oil. Very carefully, in batches place the meatballs in the oil and brown them well on all sides over medium-low heat, turning carefully with a spatula or a fork. This should take about 10 minutes for each batch. Don’t crowd the meatballs. Remove the meatball to a plate covered with paper towels. Discard the oil but don’t clean the pan. For the sauce, heat the olive oil in the same pan. Add the onion and saute over medium heat until translucent, 5 to 10 minutes. Add the garlic and cook for 1 more minute. Add the wine and cook on high heat, scraping up all the brown bits in the pan, until almost all the liquid evaporates, about 3 minutes. Stir in the tomatoes, parsley salt, and pepper. Return the meatballs to the sauce, cover, and simmer on the lowest heat for 25 to 30 minutes, until the meatballs are cooked through. Serve hot on cooked spaghetti and pass the grated Parmesan. Posted on February 12, 2009 at 7:28 am.